It took less than a minute after the plane landed on the tarmac in St. Petersburg for me to realize that this vacation was going to be drastically different than the rest. All I had to do was get through passport control. I froze. My eyes flicked wildly from wall to wall. Where were they? My beloved letters?! How could there be so many signs, but not a single recognizable word? такси. банк. цветы. аренда автомобиля. Take the English alphabet, throw in a couple extra letters, sprinkle a few accent marks on top, and you've got French, Italian, Spanish, German, Norwegian, and the rest of the European languages. Except Russian, Greek, and the like. On our trip to Greece in August last year, the Greek signs were equally mystifying, but English translations were posted all over the place, a nod to the tourism trade of Kalymnos, a rocky island which attracts climbers from all over the world. As far as I could tell in the St. Petersburg airport, the Russians weren't giving a nod to anybody else. Why should they? Today, Russian is the largest native language in Europe, with 144 million native speakers. It's one of the six official languages of the United Nations. All this surprised me because I, like many Americans, have been led to believe that English is/will be/should be a global language. Turns out that's not an impending truth at all. Though English has got a better shot than Russian. The language with the most native speakers in the world? Mandarin (935 million). This is followed, though not closely, by Spanish (387 million). In third is English (365 million). Russian comes in a distant 8th, after Hindi, Arabic, Portuguese and Bengali. If not knowing the language in a country adds a few seconds to every action you take on your visit, not recognizing the alphabet adds full minutes. Eventually, we figured out how to withdraw cash and engage a taxi. Driving along the freeways into town, I stared hard at the Cyrillic letters on the sides of buildings and trucks. 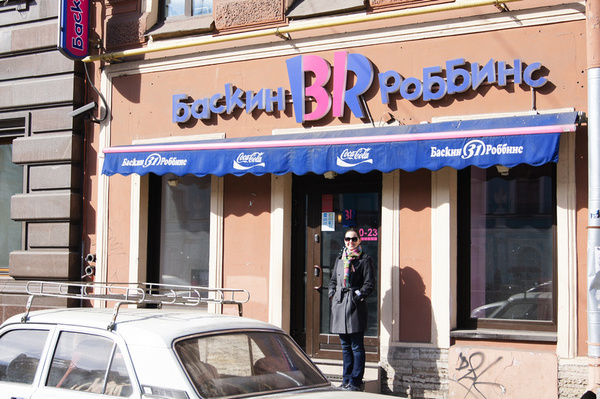 Russian translations of American brand names seemed alternately upside-down or backward. Subway. Carl's Jr. Baskin Robbins. Only the colors and fonts made them recognizable. But that actually helped! After about 24-hours, I could "read" several Russian words. Important ones, too. Like hotel, restaurant, bank, and taxi. Granted, I still have no idea how to pronounce any of it, but those landmarks made me feel more secure. Nevsky Prospekt, St. Petersburg's most famous street, and the streets around it had English translations of their names below the Russian street signs. A few restaurants also had English menus, and the servers in a couple of smaller cafes translated the menu for us. "Citizens! This side of the street is more dangerous during an artillery bombardment." And we barely noticed it. On the upside, being immersed in a world of sharp, starry, smashed Cyrillic letters for four days deepened my sense of homecoming on our flight back to Oslo. For the first time ever, I caught myself thinking, Oh sweet Norwegian, though you may only be a tiny language by global standards (5 million native speakers... not even in the Top 100 list worldwide), you are still the comforting and recognizable language of my current home. I'll be blogging more about our colorful, exotic trip to St. Petersburg, Russia, of course. But if you can't wait... our full St. Petersburg gallery is posted here on Zenfolio.